A very quick note on book titles. When I pitched the Los Nefilim series, I wrote a proposal that consisted of the first ten thousand words of the first book, a three-page synopsis (roughly … okay, three and a quarter, so what? ), and two very brief proposals, meaning a paragraph each, for the how I envisioned the next two books in the series to play out. As part of the proposal, I gave titles to all three books. That is because this is usually how proposals are submitted, although I’m sure some authors list Book #2 and Book #3, as well, who knows? I’m just speaking from my own experience. Ask any author, and they will most often tell you that they hate coming up with a title for their books. It’s serious torture. We’re trying to think of something unique enough to stand out while remaining brief enough for readers to remember. It’s a lot like writing poetry, except you only get to write one line and it can’t be too many words, because it has to fit on the cover of a book, and it also has to essentially capture the essence of your story and SURE THAT’S EASY! NOT! In my case, the original titles that I proposed for the Los Nefilim novels were: Where Oblivion Dwells; Carved from Stone and Dream; and A Song with Teeth. These are the titles that wound up in the contract, for yea, this is how contracts are written—with titles, because publishers and agents and writers and editors and lawyers love details, because legal and binding and all that. Of the three titles, I’m only going to talk about the first book for the purposes of this post. I got the title from a poem by Luis Cernuda entitled: “Donde Habite el Olvido.” I’ve seen the title translated to both “Where Oblivion Dwells” and “Where Oblivion Lives,” depending on the translator. Forbidden Pleasures: Luis Cernuda New Selected Poems [1924-1949], translated by Stephen Kessler. Boston: Black Widow Press, 2015. Where the wind goes to escape its insomnia. Where desire has ceased to exist. Smiling airily as my torment grows. With no more horizon than a face with other eyes. A light absence like a child’s flesh. The imagery and themes Cernuda expressed in this poem simply ignited my imagination and heavily influenced some of the ideas in my novel. Which made this a rare time when choosing a title wasn’t difficult at all. When I first read the poem, translated by a different individual, it was entitled “Where Oblivion Dwells.” I loved the sound of “dwells” and decided to go with that as my initial title: Where Oblivion Dwells. I did all the due diligence of running the title through Google, Amazon, and Barnes and Noble and I couldn’t find another similarly title novel in their databases. This proposal was submitted to and purchased by Harper Voyager in April of 2017. So one fine day, I was busy checking my links and did a quick name search in Google to make sure a certain link was appearing correctly, when low and behold but what did my wondering eyes see: they’d listed me as the co-author of a completely different novel entitled Where Oblivion Dwells by Lorena Franco. Of course, I’m all: wut? It seems that Ms. Franco’s novel was originally published in Spanish and it was entitled … wait for it … Donde Habite el Olvido. The novel had recently been translated into English in May 2017 and given the title: Where Oblivion Dwells, about a month after I’d done all of my searches for books with that title. Google’s algorithms apparently decided that since two women had written a book with and identical title, we must therefore be co-authors, because algorithms without human intervention are notoriously stupid. Out of curiosity, I looked at Franco's book, which is also Gothic and has supernatural elements. That put us in similar categories. However, other than the titles, our themes and stories are very distinct. This next part of this saga is very important, because at the point I discovered this SNAFU of minor proportions—which was some time in the late summer of 2017, I think—we had put zero work into the cover art for my novel. Timelines in publishing can be tight, and you don’t want to make a title change that is going to affect the work of the cover artist, who has spent effort in coming up with the right design. Not to mention the fact that the title was already beginning to show up in online searches through Amazon, etc. and is probably what caused the initial algorithm co-author issues in Google books. Someone would have to go back and make any changes to those databases. If we had gone even a month more into the process for my book, we couldn't have done what we did. As it was, we were drawing a tight line and creating more work for people, who are, like everyone else, maxed out to the max in their jobs, too. Knowing this, I emailed my editor and agent and outlined my thoughts. I wanted to see if was too late to change the title to eliminate confusion. Fortunately, David was fine with it. We decided to go with Where Oblivion LIVES, as this would cause the least disruption to the title change, and which spellcheck sometimes calls Where Oblivion LIES just for shits and giggles, I guess—I don’t know; I’ve just learned to roll with these things. So the thing with titles and the sheer number of books being published means there will be some, nay, maybe a lot of crossover in book titles. No matter how diligently you search for your novel’s title or series, someone else may be rolling in with the exact same title within days, months, or years of one another. And it’s okay. The people who are going to buy Franco’s novel, are going to buy her books. Likewise, the people who are looking for Los Nefilim stories know where to find me. Neither of us are taking anything from the other. As a matter of fact, if someone buys Franco’s novel, thinking that it’s mine, they might find themselves turned on to a new author they otherwise wouldn’t have noticed. I think that’s a win a for all of us. I don’t know about anyone else, but the very nature of social media is beginning to exhaust me. Some days I feel spread quite thin. I have a novel to write, and I’m thoroughly enjoying working with my Pitch Wars mentee, Elvin Bala. I also have all the tiny behind-the-scenes maneuvering that goes on prior to a publication, in addition to normal life events such as my day-job and family. None of this is complaining, by the way. I love all these varied aspects of my life. However, I also know when stress is beginning to affect my body, and when I have to slow down, or at least unplug somewhat. Facebook has been the first to go. I haven’t disappeared entirely there, because I belong to some public groups that I enjoy, and a private group of extraordinary fellows of arcane society and another of Harper Voyager authors, both of which have saved my sanity on more than one occasion. I’m still on Twitter, frankly because it’s easy to blurt short bursts than it is to sit down and compose a blog post. However, whenever I find myself doing a thread, I wonder why I didn’t take the time to blog. Social media demands you be there in the moment, and blogs are somewhat more static. My newsletter goes out much more randomly, but that’s because newsletters can seem kind of spammy, especially this time of year, so I tend to keep those for special announcements. In the sidebar there is a link to get the blog posts via email, in case you want to sign up there. I’ll run my blog posts through Twitter, Tumblr, and my author Facebook page. I’ll be around, but engagement on social media might be spotty for a bit. I hope you’ll understand. Some friends of mine have a saying about getting back into the mainstream of life. These last few weeks, it seems like I was swept away in a stream that became a flood, and I mean that literally and figuratively. I haven’t been blogging and only recently got back into my writing groove. My husband had some health issues with his heart for which he was hospitalized. He went to see his cardiologist and they admitted him that day. It was all very frightening and sudden, but he got the absolute best of care. I spent nine days holding down my day job, visiting him in the hospital, and doing all the things I do in addition to all the things he does. My daughter was an absolute lifesaver for me. She stayed with me and picked up all the slack. I don’t know what I would have done without her and my sister-in-law. I’m so very lucky to have them both in my life. Needless to say that my stress levels were somewhat higher than normal. Let’s all recall that I’m a little high strung in the first place. So when I went to the grocery store and saw all of the bottled water had been sold, I had a mini-breakdown on the aisle. I eventually managed to score some bottled water. I panicked and purchased about six cases. We’re good on bottled water, thank you. By the time my day ended at 8:00 p.m. each evening, I was so exhausted that I fell into the bed and died until it was time to get up and do it all over again. My husband’s cardiologist is wonderful. He did all the right things, so now I have my husband back home again. Florence was evil, but we weren’t affected with anything other than some blustery weather and rain. The first part of September was wild, and there is still a couple of weeks left, but I’m sort of hoping that it’s a case of in like a lion and out like a lamb. I’m so happy to have my husband home and feeling so much better. We’re making some lifestyle changes that will benefit us both. I’ve finally had a chance to see Black Panther. It is a wonderful movie filled with all of the things I love: a nuanced villain, wonderful acting, a clear recognition of history and how it affects our lives, and a wonderful theme. If you haven’t had a chance to see it, check it out. I also had the opportunity to read an advanced copy of John Hornor Jacobs’ new novella, The Sea Dreams it is the Sky, which is due to be published on October 30. It has been a long time since I’ve had the pleasure to read such a cerebral work of cosmic horror. The last time I enjoyed a horror novella this much, I was reading Stephen King’s 1922. In Jacobs’ novella, Isabel meets a fellow ex-pat, who is simply known as the Eye. When the Eye receives a mysterious note, he returns to their homeland and leaves Isabel in charge of his apartment. There, she finds that the Eye is none other than the reviled poet, Rafael Avendaño. As Isabel reads the manuscripts the poet has left behind, I was immersed into a creeping sense of dread that intensified with every page. Like Isabel, I was drawn into the terror of Avendaño's life during the military coup that left him maimed in body and soul. And behind the coup, seen only by Avendaño, is an ancient horror that Jacobs reveals by masterfully stripping away one layer of reality after another. Equal turns poetic and hypnotic, Jacobs resurrects the surreal imagery of Jorge Louis Borges and couples it with visceral prose that cuts to the bone. Needless to say, I loved it, and I send it your way highly recommended. Pre-order it if you can so it drops into your magical device just in time for Halloween. So that is what I’ve been doing and where I’ve been. I’ve also been reading Pitch Wars entries and having to make some hard choices. Everyone who submitted to me is talented is so many different ways. On Monday of this week, I got my page proofs for Where Oblivion Lives. They get the priority, because deadlines. I’m also working on the next Los Nefilim novel, Carved from Stone and Dream. After many false starts, the story is beginning to take shape. I can also now confirm that I will be a guest at MystiCon (February 22-24, 2019) in Roanoke, Virginia! That’s really exciting for me. I’ve been wanting to attend this con for quite some time, so I’m looking forward to being a part of their program. I’ll also be attending World Fantasy Con in Baltimore this November, so watch for me there. As always, take care. I’ll be around. This is one of those posts. You know, the ones I write so I can just post a link rather than say the same thing over and over again and again and again ... ad nauseam. My opinion will probably change at some point, because I'm flexible like that, but for now I'm venturing into the grimdark/horror arena for a reason. Yes, yes, I know all about Warhammer 40K "In the grim darkness of the far future, there is only war ..." so if you comment about Warhammer 40K, I'm going to assume you just shot down to the comments to tell me about Warhammer 40K without reading the actual post. Horror is a story where the protagonist is helpless in the face of a supernatural threat. It is an ordinary person against a much more powerful supernatural adversary. The protagonist seeks to destroy the supernatural threat in order to save themselves or others, but only when they are forced into a confrontation. The horror elements in the story are culled from the protagonist's increasing helplessness in the face of overwhelming odds. Dark fantasy is similar to horror in that it is a story where the protagonist is helpless in the face of a supernatural threat. In some cases a dark fantasy protagonist also has supernatural powers; however the individual is still against a much more powerful supernatural adversary. The protagonist seeks to destroy the supernatural threat in order to save themselves or others. Unlike horror, dark fantasy tends to have a thread of hope running through the story. While at times being helpless, the protagonist generally wins in the end; although the cost (loss of friends/family or even their own innocence) will be great. Grimdark is a story where the protagonist faces a supernatural threat, but s/he isn't helpless against their adversary. Rather than run from the supernatural threat, the grimdark protagonist actively seeks to subvert or control it. In grimdark, the characters exhibit amoral [read: darker] tendencies, which replace the element of helplessness as the primary focus of the dread/horror. There are supernatural elements in all three, but they are utilized in very different ways. What separates them is the protagonist and how that individual deals with the supernatural threat. If you've got a different definition, drop it in the comments. I'm always open to consider other viewpoints, but for now, that's how I'm defining the two. I know these long theological screeds aren't winning me either fans or brownie points with the world in general, so if you're just here for the fantasy and science fiction, move on and skip this post. Trust me, I understand. However, thoughts simmer in my brain and won't let me go until I put them down in some form. Given that none of these thoughts are pertinent to my stories, I'm going to use my long-neglected blog to hold forth on opinions that are mine and mine alone. On a road that I drive on everyday is a church with a sign, and on this sign the members of this church post phrases designed to inspire their members and anyone else who happens to be passing along. Often the words on this sign are misspelled, which worries me because it denotes a lack of care in their message. Since Easter is coming--that annual religious holiday when Christians all over the state make an annual pilgrimage to the beach--I suppose the members of the church wanted an Easter theme. This week's sign states that people's sins drove Jesus to the cross, a theological point that intimates Jesus had no choice in his sacrifice, which in turn robs the Crucifixion of meaning by implying that his death was not an offering but instead a murder. This, likewise, worries me, because it is probably an unintentional but very strange twist on Christianity's theme of sacrifice and redemption. Then, in a completely unrelated event, an individual, who I personally know identifies as a Christian, made a racist comment around me as casually as if she were commenting on the weather. Just a wee hate-filled bon mot thrown out there for the world to see. Something in my gut clenched and I thought immediately of Dietrich Bonhoeffer, the German theologian who was executed by the Nazis during World War II. Everyone remembers Bonhoeffer for his famous "First they came for the ..." speech, which reflected his belief system of putting Christian principles into action. He wrote extensively about Christianity's role in the secular world, and in doing so produced an essay entitled "Cheap Grace vs. Costly Grace." For those of you who don't know me, I was raised in Evangelical churches and I talk a little about that here. So I know that along with the prosperity gospel, the Evangelicals are also big on cheap grace. I simply never had a name for it until I read Bonhoeffer's works, but once I saw it I couldn't unsee it, so here we all are again. Cheap grace means grace as a doctrine, a principle, a system. It means forgiveness of sins proclaimed as a general truth, the love of God taught as the Christian ‘conception’ of God. An intellectual assent to that idea is held to be of itself sufficient to secure remission of sins. In such a Church the world finds a cheap covering for its sins; no contrition is required, still less any real desire to be delivered from sin. That was what I was taught. If you sin, just ask for forgiveness and everything will be just hunky-dory. Boom. I did it, I'm sorry, it's over, bygones. Finis. As I grew older, I found the Evangelical's philosophy of cheap grace to be highly empty--both from a theological and spiritual point of view. I received nothing from the experience of repentance, because no action was demanded from me. The more I read, the more I found that there is much more to repentance than simply expressing remorse and moving on. Which brings me to Bonhoeffer's flip side of cheap grace. He believed that costly grace "is costly because it condemns sin, and grace because it justifies the sinner. Above all, it is costly because it cost God the life of his Son: 'ye were bought at a price,' and what has cost God much cannot be cheap for us. Above all, it is grace because God did not reckon his Son too dear a price to pay for our life, but delivered him up for us. Costly grace is the Incarnation of God." 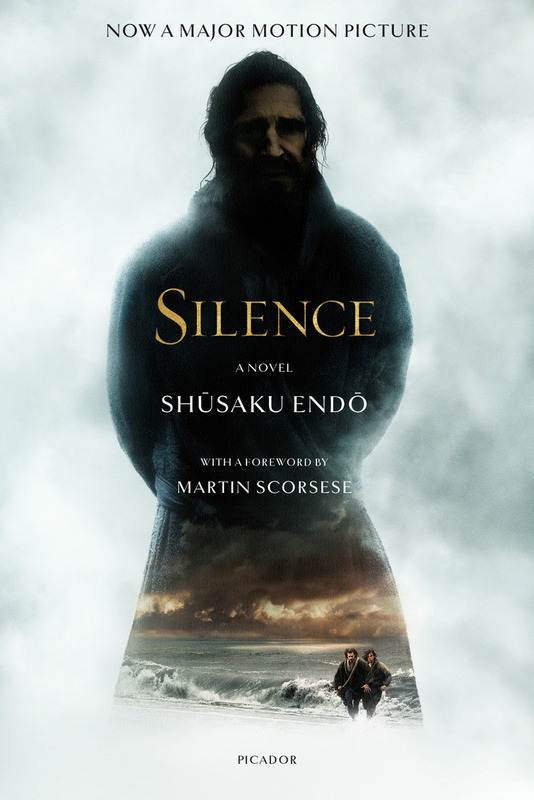 All of these thoughts were tumbling through my mind as I read Shūsaku Endō's novel Silence. Written in 1966, the story follows the 17th century Portuguese Jesuit priest Sebastian Rodrigues to Japan, roughly fifty years after the Shimabara Rebellion in 1637. Rodrigues is searching for his mentor Cristóvão Ferreira, who has renounced his faith while on a mission in the country. When Rodrigues and his fellow priest Francisco Garrpe arrive, they find that the country's Christian population are being systematically exterminated. No matter how the Christians suffered, "... like the sea God was silent." Of course, Rodrigues is eventually captured by the Japanese and is expected to renounce his religion. He meditates on the meaning of martyrdom and his faith in general. Quite a few lines of Endō's prose have stood out for me, but it is his clear definition of sin that remains closest to my heart. In Silence Endō has Rodrigues reflect that "Sin ... is not what it is usually thought to be; it is not to steal and tell lies. Sin is for one man to walk brutally over the life of another and to be quite oblivious of the wounds he has left behind." I thought of the way people I know have suddenly decided that it is okay to walk brutally over other people's lives with their words and their actions. They seem to feel their belief shields them from the ramifications of their deeds. Maybe they interpret God's silence as an endorsement to their beliefs, but I have hard time believing that is true. my life until this day would have spoken of Him." With this quote, Bonhoeffer and Endō merge. Both of them speak very strongly regarding action, a duty to respond to injustice. Speech is a conscious act and words are important. In both of the examples I presented at the top of this post, neither the church nor the individual seem to put much stock into either their theology or their how their actions affect others. Usually no one would say anything about these things, because both the church and the individual are simply voicing opinions ... right? Maybe. But should I respect opinions that are morally wrong? No. There is nothing that demands I remain silent in the face of such a case. As a matter of fact, I'm more inclined than ever to call them down, because my silence can be misinterpreted as tolerance. In Resistance, Rebellion, and Death, the atheist Albert Camus admonished Christians in 1948 to "speak out loud and clear, and that they should voice their condemnation in such a way that never a doubt, never the slightest doubt, could rise in the heart of the simplest man. That they should get away from abstraction and confront the blood-stained face history has taken on today. The grouping we need is a grouping of men resolved to speak out clearly and pay up personally. When a Spanish bishop blesses public executions, he ceases to be a bishop, or a Christian, or even a man; he is a dog, just like the one who, backed by an ideology, orders that execution without doing the dirty work himself." So I'm here to say loudly and clearly so that even the simplest person can understand: when you trample brutally on other people's lives with your words or your deeds, I'll be here to point out that what you're doing is wrong. You may wave Jesus in my face, or you can wave my admonishments off as "not a big deal." However, I will not be silent. Furthermore, I do not want an apology. I want to see your restitution reflected in the way in which you live your life. To change one's behavior requires understanding costly grace, which avoids judgmental fear and is predicated on the hardest Christian principle of all to work in our lives: love for others.